Sheffield United will only target established professionals in the January transfer window after Nigel Clough declared his faith in the club’s current crop of young talent. 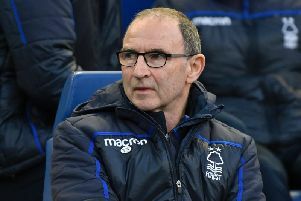 Clough, manager of the League One promotion-chasers, made the admission after Saturday’s 3-0 FA Cup second-round win over Plymouth, which ended a run of three matches without a win at Bramall Lane. “It was nice to get that win at home, after the run we’ve had over the last couple of weeks,” Clough said. “Confidence plays a major part in any football team, and any footballer. But we need players who can rise above the expectation levels that we have, especially when things aren’t going well. “So that’s why, in January, we’ll look at proven players to bring in... we don’t need any more youngsters. We have enough players with potential at the club already, with the academy players, a strong U21 set up and the recent additions of Che Adams and Kieran Wallace [from Ilkeston FC]. Clough also revealed that Chris O’Grady is “desperate” to play against Fleetwood Town on Saturday, after succumbing to a problematic calf injury just 22 minutes into his United debut against MK Dons a week ago. “We hope he’ll be fit for Fleetwood,” Clough added. “We’ll see how his calf settles down but he’s desperate to play. If not, he can’t play in the Capital One Cup [against Southampton] so he’ll be back for the Walsall game in the league. “What he does give us, though, is options - Marc [McNulty] came on against Plymouth and got a goal, Michael Higdon is back from injury and we can play Jamie Murphy or Jose Baxter up there, too. Clough, meanwhile, revealed that Craig Alcock, the former Peterborough United right-back, will not be risked until fully fit thanks to the form of stand-in replacement Ryan Flynn. Flynn, a winger by trade, has started United’s last two matches at right-back as Alcock continues to struggle with a back complaint. But, despite revealing that Alcock has “a chance” to face Fleetwood at Highbury this weekend, Clough said: “We won’t rush him back, especially with Flynny in such good form there. “Craig has played all season at right-back and Ben Davies, who is also injured, is his deputy,” Clough added. “So Flynny is our third choice, really. Clough’s side were last night drawn away to Premier League Queens Park Rangers in the FA Cup third-round on January 2-5.